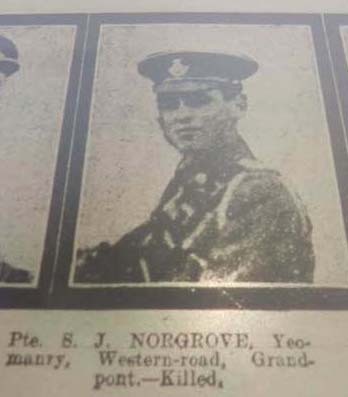 Stanley John Norgrove was born at 1 Western Road in south Oxford in 1898/9, the son of William James Norgrove (born in Oxford in 1862) and Hannah Harper, known as Annie (born in Eynsham on 2 June 1865 and baptised at St Leonard’s Church there on 3 September). In 1891 Stanley's mother Hannah Harper (27) was living with her mother at Eynsham and working as a governess who kept a school. At the time of her wedding in 1893 she was staying at Holy Trinity vicarage in St Ebbe’s. Stanley John Norgrove (born at 1 Western Road, Oxford in 1898/9, reg. first quarter of 1899). The family settled at 1 Western Road in south Oxford, and Stanley, their youngest child, was born there near the beginning of 1899. Within weeks of his birth his father William James Norgrove died at the age of 36, and his funeral was at St Aldate’s Church on 25 May 1899. By the time of 1901 census Stanley’s widowed mother Hannah had taken over her husband's business, and was living over the baker’s shop with her two surviving sons, plus a boarder and a servant girl. Stanley was then just two. Ronald Frederick Percy (born at 1 Western Road, Oxford on 29 September 1905 and baptised at St Matthew's Church on 5 November). By 1909 Stanley and his brother Hubert and half-brother Ronald had moved with his mother and stepfather to 135 Magdalen Road in East Oxford. In 1909, seven years after her second marriage, Stanley’s mother, now Mrs Hannah Percy, died at 135 Magdalen Road at the age of 44 and was buried in Cowley St John churchyard on 7 September. Thus Stanley was orphaned at the age of ten. In Oxford in the fourth quarter of 1909, just weeks after his first wife's death, Stanley’s stepfather Frederick Percy married his second wife Florence Mary Ford, and their twin children Eric John Percy and Dorothy Bettie Percy (who were of course not related to Stanley) were born at 135 Magdalen Road on 16 December 1910 and baptised at Cowley St John Church on 5 February 1911. By the time of the 1911 census the Percy family (including Stanley’s five-year-old half-brother Ronald) had moved to run a bakery and confectionery shop at Evesham in Worcestershire. The two Norgrove brothers did not remain with their stepfather and his new wife. Stanley came up to Headington to live in Lime Walk (probably the present No. 85) with his mother’s brother, the market gardener George Harper, and his family, while Hubert (15) went to live at the Druid’s Head at 35 George Street, Oxford with his mother's other sister Elizabeth and her husband Edward Heritage. At the time of the 1911 census Stanley Norgrove (12) was at school (almost certainly Headington National School), and living at Lime Walk with his uncle and his family. His brother Hubert (15) was working as a fishmonger's errand boy and living at the Druid's Head with his aunt and her family. In the First World War Stanley John Norgrove served as a Private first in the Queen’s Own Oxfordshire Hussars (Service No. 3178) and then in the 2nd/4th Battalion of the Oxfordshire & Buckinghamshire Light Infantry (Service No. 203625). He must have lied about his age, as in 1917 men had to be 18 to enlist and 19 to be sent to the Front. He was killed in action in Belgium at the age of 18 on 16 August 1917. 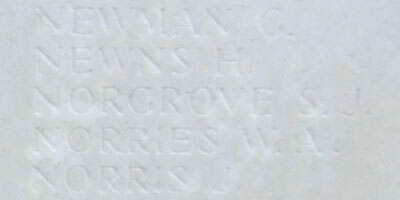 He has no known grave, and is remembered on the Tyne Cot Memorial (Panel 96 to 98). The photograph of his name on that memorial (left) was kindly supplied by British War Graves. 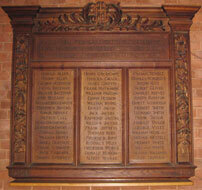 He is also remembered on the Roll of Honour of All Saints’ Church, Highfield. Hubert James Norgrove married his first cousin Winifred Hester Harper at All Saints’ Church in Headington on 21 April 1919. He was then a signaller in the Royal Navy, based at Portsea, and they started out their married life with the Harpers at Arthur Cottage, Lime Walk and they were still living there when their daughter Kathleen Winifred Norgrove was baptised at All Saints’ Church on 11 April 1920. They remained in Headington, and were at 241 London Road by 1935, and at 4 St Leonard’s Road by 1964. George Harper died at the age of 73 at 47 Lime Walk (now renumbered 85) and was buried at Headington Cemetery on 2 June 1934. Mrs Esther Harper died at 239 Iffley Road at the age of 74 and was buried with her husband on 3 April 1939.